According to the new market research report “North America Electromagnetic NDT Market by Method (Eddy Current Testing, Remote Field Testing, Magnetic Flux Leakage Testing), by Vertical (Oil & Gas, Power Generation, Automotive, Aerospace, by Country (The U.S., Canada, Mexico) – Trends & Forecast to 2015 – 2020”, the total North American electromagnetic NDT equipment market is expected to reach $223.76 Million by 2020, at a CAGR of 8.84% between 2015 and 2020. There are various types of electromagnetic NDT methods such as eddy-current testing (ECT), remote field testing (RFT), and alternating current field measurement (ACFM) testing, which are used by the industry verticals. Of all these techniques, the eddy-current non-destructive testing method is most preferred type of electromagnetic testing method for the detection of surface-connected flaws. This NDT technique is ideal for non-ferrous parts and is capable of inspection through coatings that are intact and smooth. The high demand for eddy-current testing equipment is especially driven by the growing automotive sector in North America. 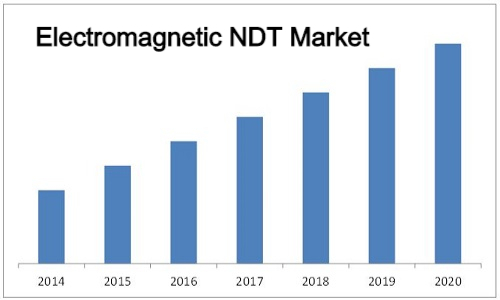 Magnetic flux leakage testing equipment held the second prominent position with a market share of around 16% of the overall North American electromagnetic NDT equipment market. The market is mainly segmented into three countries, namely, the U.S., Canada, and Mexico. The overall non-destructive testing market is highly fragmented and competitive. This market is relatively immune to major economic slowdowns, and hence, presents a tremendous potential for growth. The U.S accounted for the highest share of 58% of the overall market in 2014. The U.S. has been a major contributor to the overall non-destructive testing equipment market, but recently, Mexico and Canada are emerging as important manufacturing hubs for the automotive and power generation sectors.